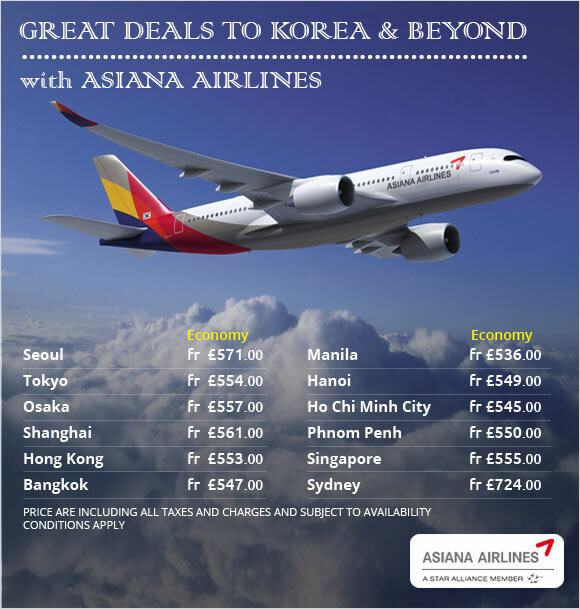 Are you looking for some of the finest deals on flights with the Asiana Airlines that are simply beyond compare? Then, you have to search no more. Founded in 1988, Asiana Airlines is one of the prime airlines of South Korea and its headquarters are based in Seoul. The airline is a member of the Star Alliance and offers 516 daily flights throughout Asia, Europe, North America and Oceania. It operates 14 domestic and 85 international passenger routes. Asiana Airlines is the company that values customer satisfaction and a service that is based on the customersâ€™ expectations. Asiana Airlines strives to bring forward an everlasting comfort to its passengers so that they can look forward to a soothing flying experience with the airline. It is always developing to ensure that its passengers are provided a comfortable journey so that they can come back for some more flying with the airline. Customer commitment has always been a top priority at Asiana Airlines. The airline was honoured with an accolade of “Airline of the Year” by Air Transport World, which is considered as one of the most honourable awards in the airliner industry. 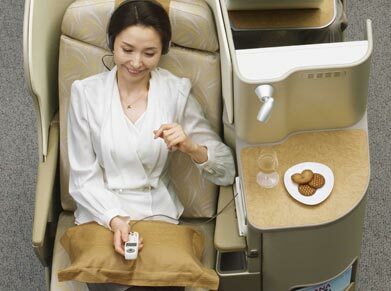 Your flight with Asiana Airlines is bound to be a pleasurable one the instant you step on board the airliner. 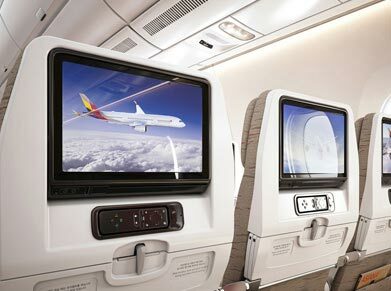 Those passengers going up in the air with Asiana Airlines are really in for a surprise as they would be the experiencing the best of what Economy Class has to offer. The comfort provided in this class is extremely commendable as the airline has won an accolade for the Best Economy Class Airline Seat at the 2012 World Airline Awards which were held at Farnborough Air Show. How’s it sound? Sure it must have taken the wind out of your sails. Flying with Asiana Airlines’ Economy Class is praiseworthy as you are bestowed with a lot of amenities that result in a smooth journey. You can seek perfect relaxation travelling in Economy Class as the seats have a seat pitch of 32 inches and they recline to 180 degrees so that you can tilt back and relax. Excite your sweet tooth with unique and elegant in-flight meals that include Asian and western cuisines. Grab a bite or two of highly nutritious Ssambap and Bibimbap as unique Korean dishes. You can also ask for Chinese dishes, Japanese dishes and other snack foods. Indulge yourself in a guilty pleasure with a wide array of liquor, beer, various teas and juice. Grab a pleasing level of comfort with in-flight entertainment systems and a 6.5” LCD monitor. Take delight in AVOD system and choose from favourite contents, movies, music and games. Your journey would become more pleasing while travelling in Economy Class. This is because of the reason that your business would be executed faster and effortlessly. Flying with Business Class of Asiana Airlines would take you on a pleasing journey that you would cherish for years to come. How’s it feel to take to the air with finest Business Class? Feels great, doesn’t it? Business Class is equipped with all the latest amenities that are just enough to make your flight a memorable affair to remember. With so much to experience aboard, you would be bowled over travelling in elite Business Class. Look forward to a tranquilizing atmosphere as the airline offers a supreme service right when your journey begins to its end. The service provided is simply unmatched in the aviation world. Settle down with wide spaces between rows that range from 58 to 62 inches in width. Derive absolute pleasure from in-flight experience. 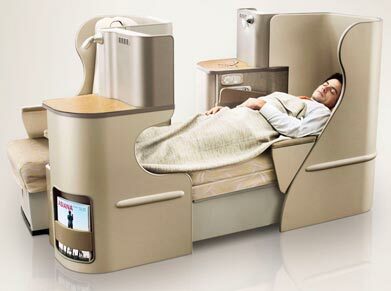 You can recline on 167 degree bed-type seats. Take delight in premium champagnes that are meticulously selected by the world’s top sommeliers. Grab a bite of Korean dish like bibimbap and diverse western meals. You can send and receive the e-mail and SMS with the help of personal monitor and headset in the cabin. Thrill your senses with AVOD with a large 15 inch monitor where you get a selection of 30 movies. Feel at rest in the sky. If you’re looking ahead to unspoiled relaxation, then taking to the air with Asiana Airlines’ First Class is a perfect decision. The First Class would provide you an ultimate level of comfort the instant you set off a venture to your chosen destination. The comfort and convenience are top-notch that you may not find with any other airline. So, hop on the First Class for a ride of your lifetime. The airline offers a supreme service that begins on the beginning of your journey till you don’t reach your destination. Your journey will be more tranquilizing and your business would be realized faster. Stretch out with wide seats with a width of 83”. Now, grab a golden chance to enjoy your dream flight in a wide seat. What’s more? Your privacy is protected with a seat that is isolated by a partition. Asiana Airlines provides you warm comforter and lightweight sets such as mats, pillows and comforters provided at your request on US and EU routes. Get rid of your fatigue on long-haul flights with soft and warm pajamas that make you feel at home. Remain in contact with your loved ones on the ground with a satellite phone . Take delight in fresh and elegant top-notch champagne, XO class cognac, fine whisky and a variety of other wines and beverages to provide utmost pleasure.